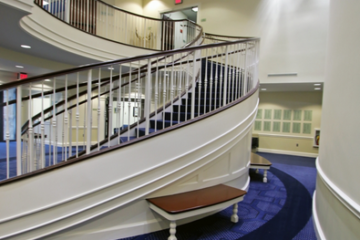 Located at Washburn University, the Bradbury Thompson Alumni Center is designed to serve the needs of alumni, current students, administration and the greater Topeka, KS community. The center opened to great fanfare in April 1996 after more than a decade of planning and fundraising. 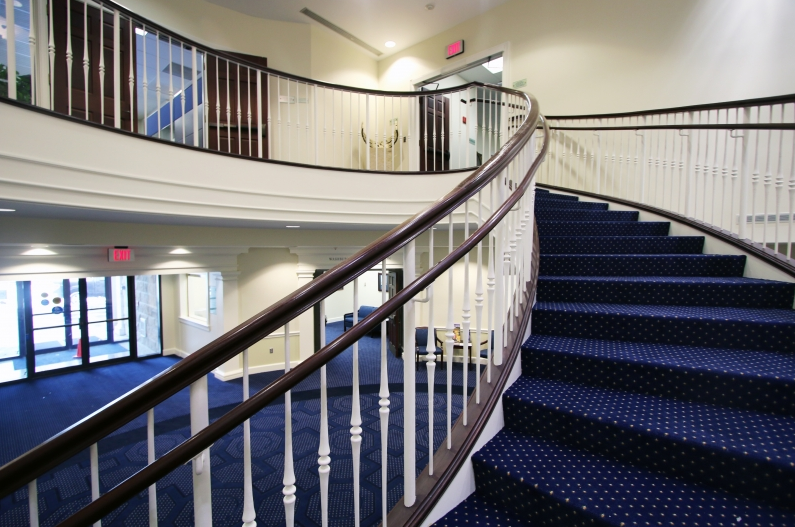 Illuminated by natural light streaming from skylights and featuring a custom-made spiral staircase, it remains an important mainstay on campus. 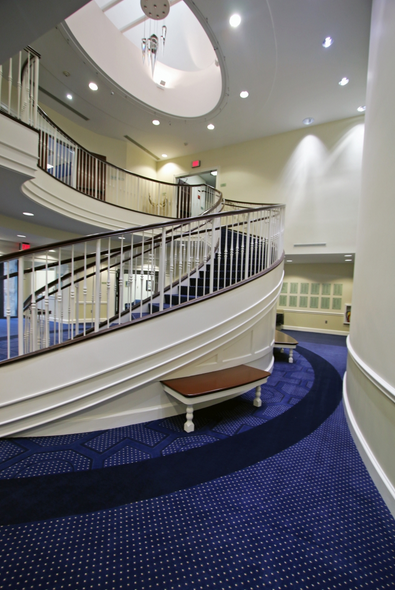 The university recognized that it was time to replace the worn-out broadloom carpet found throughout the central space. 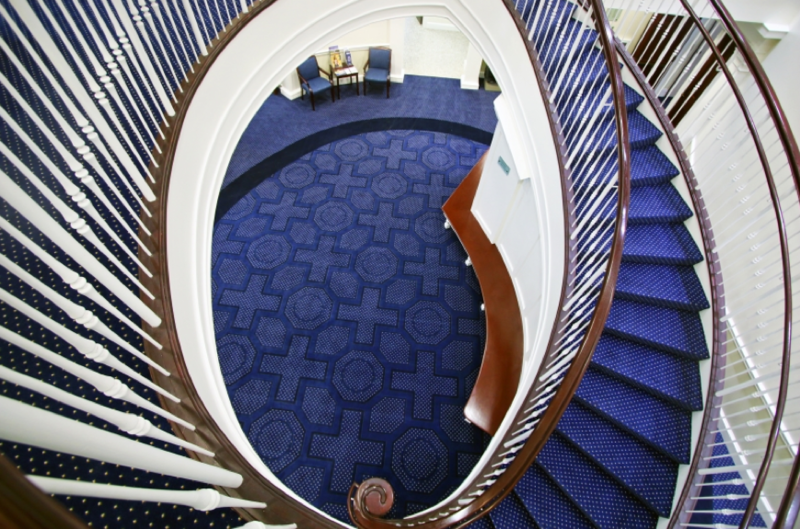 Instead of modernizing the design by selecting carpet tile, officials wanted to keep the original character of the building. That’s when Image Flooring, an INSTALL Warranty Contractor with extensive knowledge and training got involved. In the past two decades, the industry has moved away from broadloom toward modular flooring options, especially in education. The Image Flooring team pulled out old tricks and instructions for lining up patterns and seams. Even for the most experienced installers, it takes a bit of time to remember how to manipulate broadloom design work. This presented an exciting opportunity for the team to return to “old school” broadloom installation. The architecture of the Bradbury Thompson Alumni Center incorporates finishes that appeal to conservative Midwestern values. 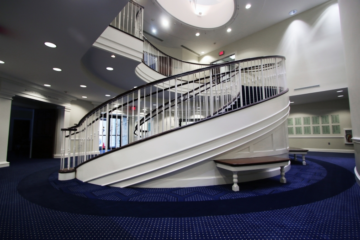 In order to maintain its personality and create a familiar feeling for alumni returning to campus, it was decided that the team from Image Flooring would replace the original flooring in its entirety. The replacement products were identical, presenting a unique set of challenges. 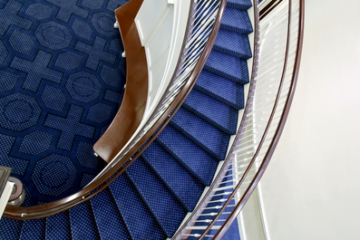 One of the most challenging tasks was removing the existing staircase carpeting. It took nearly three hours to remove each individual step. The team ended up purchasing a special hand-held carpet removal tool to assist with the process. 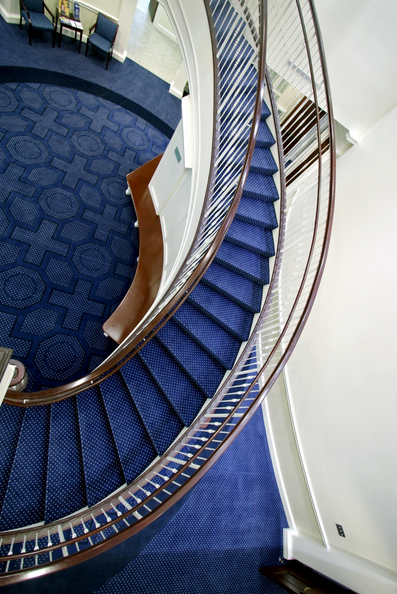 When it came time for installation, custom cutting was necessary as each step in the spiral staircase varied in size from side to side. Another challenge was keeping the patterns in line throughout the space. One little mistake would throw off the entire look and stand out like a sore thumb. Since patterns don’t come perfectly straight when you order the carpet from the manufacturer, this made the installation even more intricate. 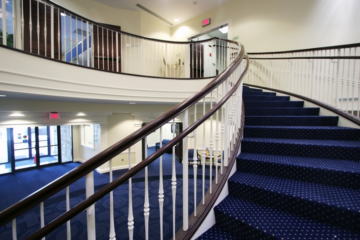 For example, the circle around the stairwell met patterns on either side and had to line up exactly. This wouldn’t be as big of an issue in most other projects, but floors are easily noticeable when guests, visitors and staff have an aerial view. The installation team completed The Bradbury Thompson Alumni Center project over the university’s annual holiday break. Additionally, the team was limited on timing with other concurrent renovations being completed in the space, which included major repairs to a slab in the front of the building that cracked as a result of settling. The finished project is a shining example of why experienced and versatile INSTALL Warranty Contractors are both important and valuable. Image Flooring is competent and experienced with both traditional and more recent installation techniques by virtue of INSTALL training. Less trained installers and newer shops don’t have the skill and proficiency to work with complex broadloom carpet. They are unable to successfully complete projects that feature the patterns, shapes and other installation aspects like those found in the Bradbury Thompson Center. University officials, along with staff, alumni, students and the community are thrilled with the refreshed space. They look forward to twenty more years of fulfilling the mission of Washburn University in a flagship space at the center of campus.